If you are looking to reverse engineer .apk files then there is a perfect tool out there for it. The tool is called Android APKTool and it is available for free. This is a great tool that comes in handy when you have to reverse engineer certain .apk files to apply tweaks to them like fixing bugs. Then you can recompile the application file again to get it working. 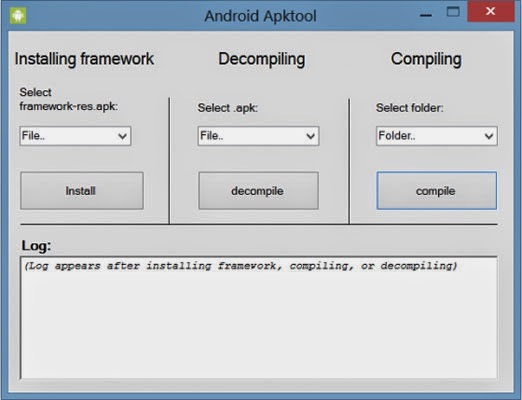 This is a quite handy tool for decompiling and recompiling Android apps. When you decompile an .apk file, the source code for the file will be generated which is quite close to the original source code. The tool is just a couple of MBs in size and the features it offers are noteworthy. It should be noted that this tool is not to be used for copyright protected apps. That means you cannot reverse engineer apps and then publish it as your own. That would just be like pirating the app and this is highly illegal. Just recently APKTool was updated to bring a new design and new or improved features to the Windows program. There are actually two versions of this program: a Windows 7 version and a Windows 8 version. The Windows 8 version is the one that has been updated. The Windows 7 version is still the same. But lucky for us, the Windows 8 version works fine in Windows 7 excepted a few minor glitches. So try this Windows application and see if it fits your app decompiling needs.